In summer 2003, I met Larry Niven in the hallway at Albacon and pitched him two story ideas for Man-Kzin Wars. He liked them, asked me to send them, I did—and so began an almost comical tale of missed emails, misplaced world bibles, and general mistakes that kept them from getting to print for almost a decade. 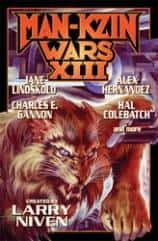 However, here they are together in Man-Kzin Wars XIII: Pick of the Litter and Tomcat Tactics. A pair of braided novellas, they actually work as a short, two-part novel (about 75 K) long.